The most notable man claiming to have flown before the Wrights was Gustave Whitehead, who is purported to have designed, built and flown his own craft approximately two years before Orville and Wilbur Wright. Mr. Whitehead last Tuesday night, with two assistants, took his machine to a long field back of Fairfield and the inventor; for the first time flew in his machine for half a mile. It worked perfectly, and the operator found no difficulty in handling it Mr. Whitehead's machine is equipped with two engines, one to propel it on the ground, on wheels, and the other to make the wings or propellers work. "A novel flying machine has just been completed by Mr. Gustave Whitehead, of Bridgeport, Conn., and is now ready for the preliminary trials. Several experiments have been made, but as yet no free flights have been attempted". Could be that the Wrights were the first to achieve flight, even though Whitehead's machine may have been built earlier? "That Whitehead designed and built (and flew) gliders and designed and built powered flying machines is not in dispute. That any of his heavier-than-air powered machines flew is." Is there credible evidence proving Gustave Whitehead achieved powered heavier-than-air human flight before the Wright brothers? When asking "who was the first to fly?" the question is usually interpreted to mean "who was the first to achieve powered, controlled flight in a heavier than air machine". That excludes a number of glider builders, the most prominent being Otto Lillienthal, who nonethless deserve credit for being great aviation pioneers and inventors, on whose shoulders the powered aircraft pioneers built their work. Augustus Moore Herring, October 1898 "Herring is reported to have flown his powered glider on two attempts. [...] While Herring's craft probably did fly with an engine aboard, the craft was not controlled and the flight was not sustainable." Preston Watson, summer 1903 Local residents recalled witnessing Watson making short flights of an aircraft powered by a single engine between 1903 and 1904, but no one could remember any exact dates. Gustave Whitehead, August 1901 According to Whitehead supporters, his greatest success came on 14 August 1901 when Gustave is said to have made as many as four test flights of the No. 21. [...] Unfortunately, the evidence to back up any of these rather extraordinary claims is sketchy, at best. The most ardent believers in Whitehead's accomplishments did not publish any of their claims until over 30 years after they are alleged to have occurred. By this time, only one eye witness could be found to corroborate the stories, and this individual had a financial interest in a book being written about Whitehead. [...] Perhaps the most telling evidence of all is the fact that his wife could not remember any instance of seeing her husband flying in one of his planes. Other contenders for the "first airplane" laurels merely made short or uncontrolled flights. Clement Ader can be credited with the first powered takeoff in 1890. But his steam-powered aircraft reached an altitude of eight inches, sufficient to classify it as a flight only to his French countrymen. German-born Gustave Whitehead was adept at fabricating stories about flying in the U.S., but he never built a workable airplane. New Zealanders are proud of Richard Pearse: in March 1903 this reclusive, eccentric farmer flew his bamboo-and-canvas monoplane for about 450 feet before crashing into a gorse hedge. His example illustrates, rather painfully, the need for controllability in aerial navigation. By appropriately expanding the definition of "fly" (or by choosing to believe some undocumented and implausible claims) you can make a case for some of the other pioneers. But the Wrights undoubtedly have the best documented and most credible case for being the first to fly. The Scientific American credited Whitehead with the successful powered flight of his 1901 aeroplane, in at least 5 known articles. The one previously noted above that shows he hadn't flown was made in June, 1901, just before these flights. All of the above, with links, are located together on http://gustavewhitehead.info/scientific-american-on-early-flights/. For video of some historic Whitehead sites, a history of the first flights of mankind by Gustave Whitehead up through 1901, and footage of a replica in flight, with commentary by Smithsonian's curator Tom Crouch, pertaining to Whitehead and the Smithsonian-Wright Agreement of 1948 (the Contract binding Smithsonian to recognize only Orville as first in flight) view this documentary on Amazon Prime: First Flight: Conquest of the Skies http://a.co/d/7qGRnqx. This documentary explains some of the evidence and the conundrum that aviation historians run into concerning first flight credit. 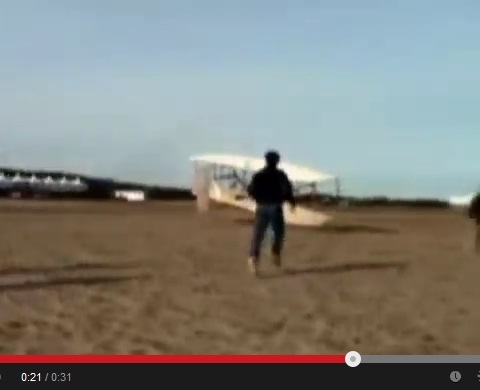 The evidence does not support the claims of the Wright brothers. The well known picture allegedly taken on December 17, 1903 and the declaration of one witness come in conflict with Wrights' own statement published by all major American newspapers in January 1904. Daniels twice wrote he had seen the machine being carried up the hill before each of the two flights he remembered. However, the declaration of this man is inconsistent with what the Wrights declared for the newspapers. They said they had taken off from a flat surface. No hill is mentioned. 2) This is what the Wrights stated in January 1904: “Wright Flyer”, Dayton Press, Ohio, US, January 6, 1904, Library of Congress, US. 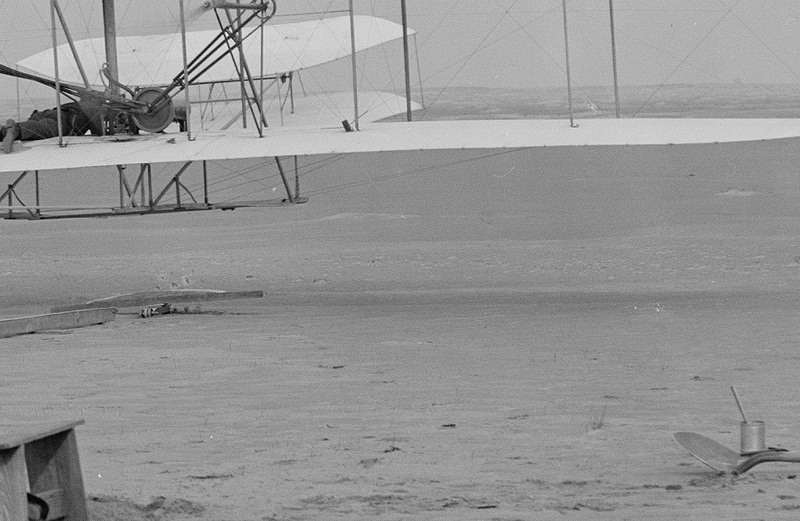 3) Here is a detail of the well known picture allegedly taken on December 17, 1903. The slope going down in front of the plane is clearly visible. 4) Had the Wrights published the above photo (and others they said they had taken between December 17, 1903 and October 5, 1905) immediately then they would have really had strong evidence to support their claims. Unfortunately, the two inventors made their pictures public in September 1908. There is no evidence regarding the true date when each photo was taken. 5) The 852 feet of stable flight, claimed by Wilbur Wright for his best trial of December 17, 1903, is also inconsistent with the 115 feet of chaotic flight which is the maximum the test pilot Dr. Kevin Kochersberger obtained (on December 3, 2003) with a replica of the alleged 1903 Flyer. It depends what you call "to fly". Clément Ader is sometimes said to be the first to fly, but that's a disputed assertion, especially outside of France. He invented the principle of the profile of the wing, and was one of the first, who recognized, that you needn't be thinner than air, to fly (principle of the Mongolfiere). Not the answer you're looking for? Browse other questions tagged history aviation . Did the Ottoman sultans kill their own brothers? Is it possible to fly like a bird using semi-motorized wings? Were metered taxis busy roaming Imperial Rome? Were two brothers killed on the same moped by the same taxi driver, exactly a year apart? Did an Indian man make an airplane or flying device in 1895?